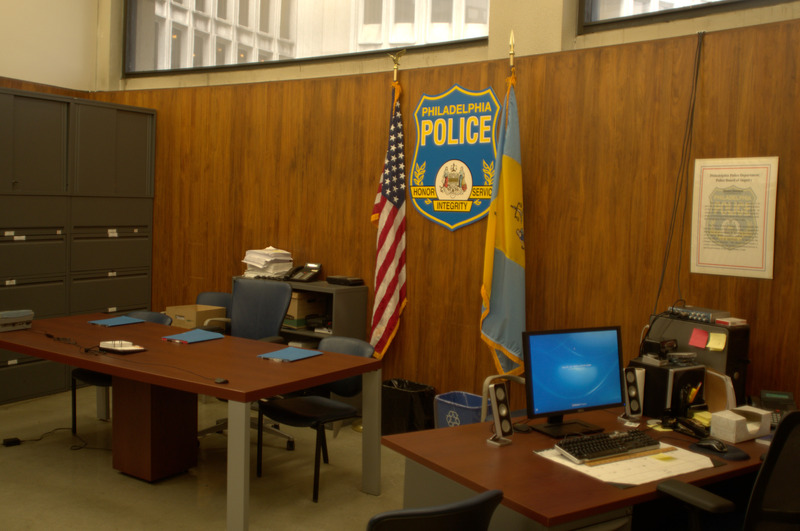 “Nope, not today,” reads a sign sitting on a desk in a room utilized by the Police Board of Inquiry at the Philadelphia Police Department’s headquarters in the Roundhouse building. Philadelphia Police Officer Jerry Torres, who is currently assigned to the External Services Unit in the Special Operations Division, pled guilty to one charge of conduct unbecoming an officer before the Board at a public hearing on July 10. The Board accepted his plea and his attorney’s suggestion that discipline be limited to a one-day suspension using vacation time. The entire hearing lasted under 20 minutes, but might have appeared to be a surreal event to an outsider not familiar with the internal workings of the Police Department. And the police don’t currently make much of an effort to demystify these scenes. When a citizen makes a complaint against an officer, other officers from Internal Affairs determine whether to “sustain” the complaint or drop it. Sustained complaints can be acted on directly by the Police Commissioner, or sent to the PBI for their recommendations. “Hearings shall be informal and strict rules of evidence shall not apply,” reads Executive Order No. 7-11, which outlines how the Philadelphia Police Department handles disciplinary hearings resulting from citizen complaints. The PBI itself is made up of a rotating group of three police officers. Capt. Frank Banford, Lt. Juan Perez, and Officer Kyle Smith made up the Board at the July 10 hearing. Acting as both the judge and jury, these three made up a third of all of those present at the hearing. But why were these particular three chosen to serve on this hearing’s Board? “They’re trained,” said Lt. Kenneth Michvech who acted as prosecutor. Michvech was the only one sitting at a table across from the the Board in the trial-like setup. Unlike Torres’ counsel, who was provided by the Fraternal Order of Police, Michvech is not a licensed attorney. To the left of Michvech, Torres and his lawyer Timothy Strange sat at a table next to a wall out of different eras. Modern slate gray file cabinets contrasted with the 1960s wood panels. Speaking over the sound of the air conditioner, Strange told the Board that “neck-deep” negotiations were conducted in the case. Torres was sworn in, but questions on the specifics of the complaint were not asked. Because Torres pled guilty, the Board did not call any witnesses to testify. The hearing wrapped up jovially with all parties and the Board exchanging handshakes and smiles. Under Executive Order 7-11, citizen complaints are also public, but anyone wishing to obtain a copy must make an appointment to view the records at the Internal Affairs office in the Northeast. The Police Department does not publish a list of upcoming hearings, and it does not provide any information in response to public inquiries other than the dates of disciplinary hearings, making it infeasible to obtain a copy of the complaint against Torres beforehand. At the urging of The Declaration, officials from the City Managing Director’s Office are currently working on guidance to remedy these and other shortcomings in the citizen complaint process. The PBI only makes recommendations as to whether an officer misbehaved and as to the punishment. Ultimately, Police Commissioner Richard Ross will have to decide both issues. The Declaration will provide more details about the case, including on the original complaint as well as the Commissioner’s final decision, in a future story. Please donate to The Declaration to support our journalism. You can make a recurring donation with Patreon or make a one-time donation with PayPal.